My Den: Great Holiday Gifts For Children. 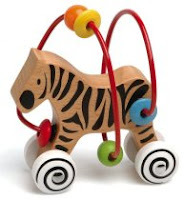 Imported from Europe, this fun Happy Zebra bead frame on wheels is beautifully crafted of wood and wood beads and will keep little hands and minds busy for hours and develops fine motor coordination and critical thinking skills as the child slides beads across the tangle of wires. Washes easily with a damp sponge. Recommended ages 1 & up. Size - 7" x 3" x 6". 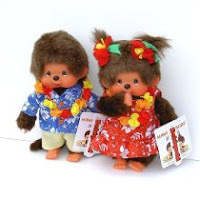 Delightful and adorable Monchhichi 8"Dolls. Based on the adventures of a monkey from the popular Japanese animated series "Futago no monchhichi", these cute 8" dolls are highly sought after collectibles by young and old. Assorted Monchhichi 8" Dolls From Sekiguchi. Price : From $15.95 onwards. KidKraft Veranda Swivel Dollhouse , mounted on a 360 degree swivel, offers plenty of room for your child's dolls and her BIG imagination. With 24 pieces of furniture, 4 rooms and 2 levels, the included wooden doll family of four, can move in right away. Let your little one use their creative eye to arrange and decorate the living room, bedroom, kitchen and bathroom. 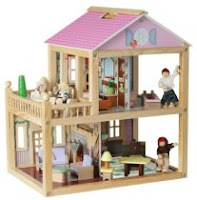 It's a dream house your little doll will love! Measures 23 1/2 x 2 1/4 x 8"
With Hasbro Transformers Cyber Stompin' Action Figures, kids can take control of the Autobots and rescue Earth from the ruthless Decepticons. Based on the characters from the 2007 summer blockbuster hit movie, "Transformers," this action figures series has battle sounds and features galore and will let kids relive all of the movie's best scenes. Recommended for ages 4 and up. Assorted Hasbro Transformers Cyber Stompin' Action Figures. Price : From $9.99 onwards. Girls can style Princess Rosella for the royal ball as they sing along to favorite songs from the beloved "Barbie as The Island Princess" movie. The beautiful island rose becomes the microphone and girls can even record and play back their performances. 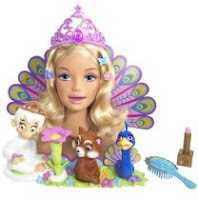 Play set includes hairbrush, clips, faux makeup and a special tiara that girls can share with Princess Rosella. The bride Giselle debuts from the blockbuster Disney movie "Enchanted," in stunning lightweight tulle and rich brocade with princess sleeves, gloves, a tiara and hair adorned with sprays of delicate faux flowers. Doll measures 12" tall. 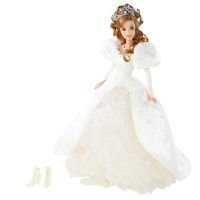 Disney Giselle Fairytale Wedding From Mattel. 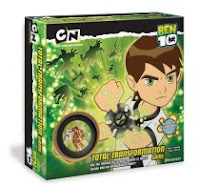 Based on Cartoon Network's smash hit - Ben 10, this game features a three-dimensional Omnitrix that tells players what alien they turn into. Will it be the one they need to fight the villain they just encountered? If it is, you've captured it and continue on to your next challenge. For 2 to 4 players ages 7 and up. Attach Jedi Starfighters to hyperdrive rings and blast off into hyperspace. 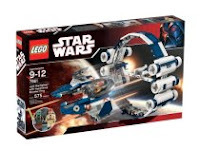 Removable Jedi Starfighter features retractable landing gear, multi-position wings and an opening cockpit that can seat Obi-Wan Kenobi or the firstever Kit Fisto minifigurine. Hyperdrive ring features flick-launching missiles and opening starfighter connection plates. Size 11.34"H x 18.92"W x 2.83"D.
Discover the fantastic micro-world of ants with Forest Ants, of the Antquarium range. 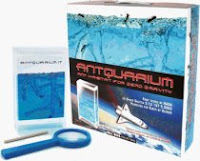 An educational and interactive game, learn how ants build tunnels and their habitat in a blue transparent Gel, while a rain forest grows on the gel surface.The tiny Forest Ant Ecoterrarium measures 5" x 3-1/2" x 1"